Customer Relationship Management (CRM) is an entire business strategy - not simply a technology for managing relationships with potential and existing customers. The main focus is building long-term relations and customer loyalty. It helps you improve your interactions with customers and how you do business overall. Most often, when someone refers to CRM, they are talking about technology-based CRM system. It is a software where you gather information about your customers, track engagements and sales, manage marketing, and more. Basically, CRM is a software where you collect and structure information about your customers from a range of different channels, including a company’s website, phone, email, marketing campaigns, manual data entry, and more. Using a CRM solution assists you to offer a more individual contacting approach and to provide superior support. A CRM system integrates and automates sales, marketing, and customer support in a single solution so you can more easily access and manage all customers' related activities. A customer relationship management (CRM) solution can benefit you in many ways, but most importantly it helps you convert leads into customers, win deals and improve customer service, loyalty, and retention. 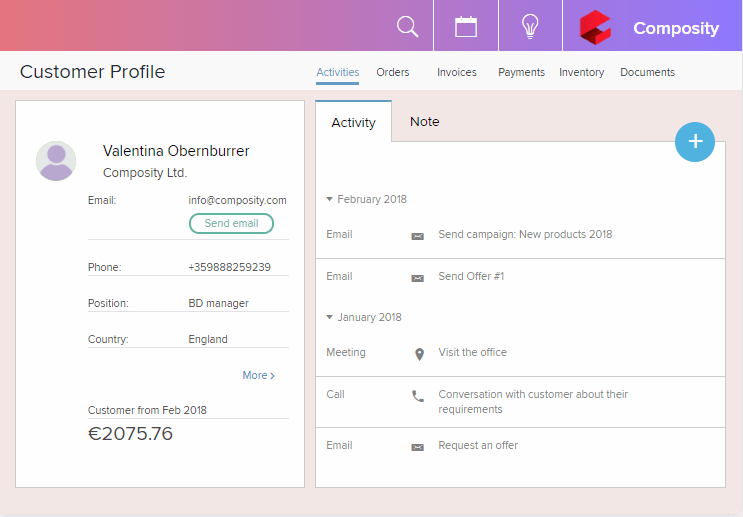 Know the important details about your leads and customers - All contact details, information about deals, historical data and more, are stored in an easy to access place. You’ll always have access to up-to-date customer information. Offer better customer support - You have a consolidated knowledge base of each customer's past orders, requirements, preferences, interactions with your company, etc. All this information helps you identify customer needs easily and serve them better. Automate your marketing efforts - Plan, create and launch effective marketing campaigns directly from your CRM solution with features like mailing, website builder, web forms, and more. Get data-driven insights into your business - Allows you to anticipate future business needs based on historical data about sales and services trends. The generated insights help understanding your customer's needs and expectations and take the right outreach. Why choose a cloud-based CRM software? Choosing a CRM tool can seem like a huge step. Especially if you have in mind Salesforce or some other large solution. But this should not make you jump back to the familiarity of Excel spreadsheets, as there is a new generation of solutions that are designed for small and mid-sized companies - they are all ease to use and quick to implement. With the advancement of cloud computing, SaaS CRM systems such as Composity CRM make installation of software useless. It is no longer needed to set up hardware and keep IT crew. Costs are low and the whole system is maintained by the software provider. All members of your team are always looking at identical and up-to-date information. SaaS software is updated in real-time and accessed through your browser, all the time, everywhere! Are you looking for a CRM? Learn more about how Composity CRM can make your life easier and more productive. Even better - the software is completely free up to 3 users!